Sadly, this year is shaping up to be the year of Syrian refugees. Although the countless stories of people fleeing their war-torn country are heartbreaking, we need to look at some of those stories with a pinch of salt. Unfortunately, in some cases the world continues to be misinformed by images and video circulating online that are purportedly of the tragedy but have actually been manipulated or described inaccurately. The reasons vary from clicktivism to politics. 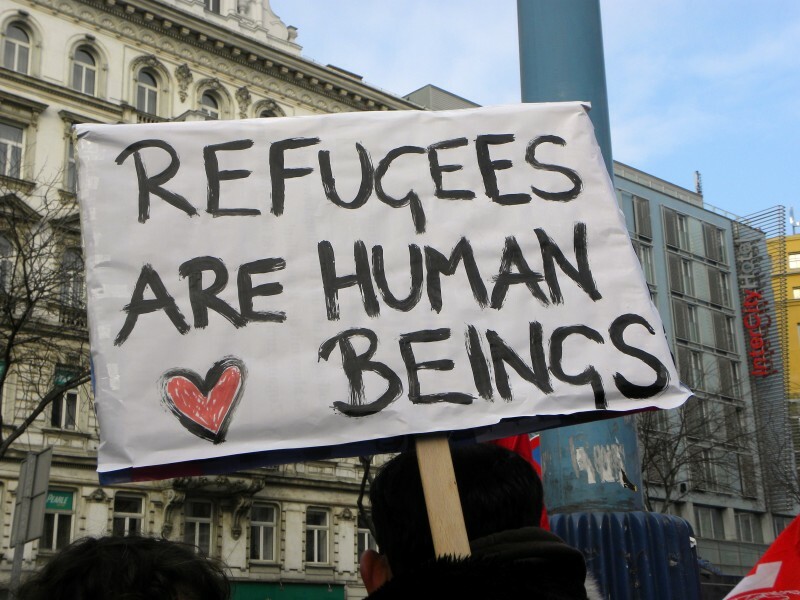 For instance, some European right-wing political parties are using the recent refugee crisis to further push their agenda and close the doors on Syrian refugees taking refuge in Europe. In fact, a photograph claiming to show Syrian refugees waving the ISIS flag in Germany, which is widely being shared on Facebook, is three years old and is not related to the current crisis. Below are four stories of Syrian refugees stories you may have come across on your social media accounts, which are far from what they appear to be. An Italian model is filming a video on the beach and suddenly the unexpected happened and a group of unexpected refugees arrives on the beach safely in Italy. This model will become famous for this funny and spontaneous incident which will not repeat itself. Most of them are Syrians and Palestinians. Thank God for their safety. 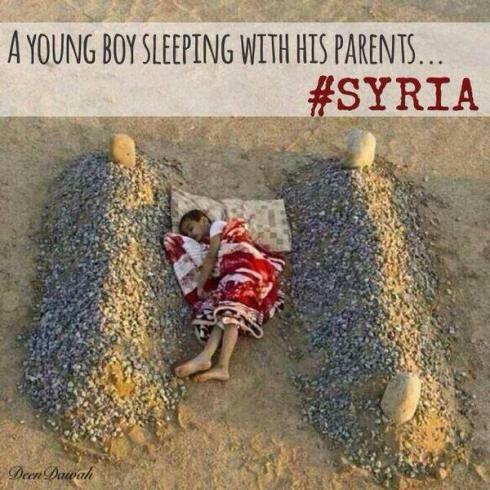 “There’s a big chance you have seen this dramatic picture of a Syrian boy covered by a blanket sleeping between the two graves of his dead parents. It went viral after some big accounts published it [in January 2014] on Twitter,” reads Harld Doornbos Blog. YouTube user komehtap K stated that Muslim refugees, on the border between Macedonia and Greece, refused the food parcels distributed to them because they carried the Red Cross symbol, which is, according to the author, not halal. While the video is true, this information is totally false. According to Red Cross spokesman John Aangendal Nielsen speaking to French newspaper Liberation, refugees refusing the parcels was not related to the contents, which were halal, but was a kind of protest against the police who blocked their way and kept them stranded throughout the night under the rain. The headless chicken reaction by the leaders of the European Union regarding mass migration by hundreds of thousands of people has resulted in these so called refugees not only demanding to be allowed to go where they want to go, but insisting on subscribing to the religious bigotry they claim they are running away from. Unbelievable and ungrateful! #Syrian #refugees in #Hungary are complaining because the food they are being given is not guaranteed as Halal. 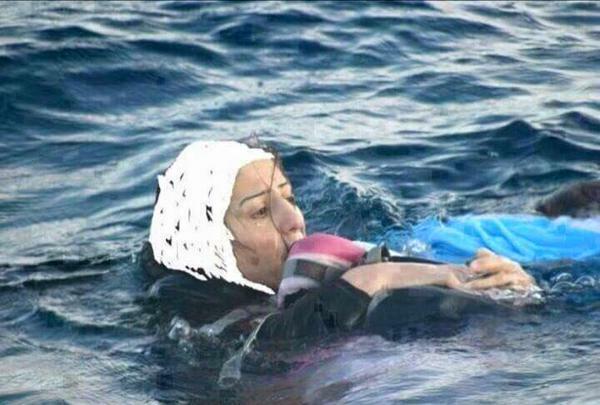 A Syrian mother trying to swim to safety carrying her toddler child. Photo gone viral (source unknown), but it isn't what it seems to be. This terrifying photograph shows Syrian refugee Rukhsan Muhammed who was rescued off the coast of Turkey in 2013 after the boat she and her son were on capsized. Without the need for an expert’s inspection it is clear that a white headscarf has been crudely applied to the photograph using digital tools. The moment captured is one of utter despair, indeed since the photograph was taken we learned that Rukhsan had been in the water with her one year old son who was washed away and drowned by the strong currents. So why trivialise this awful situation by drawing on a headscarf to protect this poor woman’s modesty? Of course underneath any clothing is a human being, a mother who has lost her child and nearly her own life. We want to care about this person and if she lived to tell of her ordeal. Within the series of images from the Anadolu Agency we can see that Rukhsan was thankfully rescued and what is striking to us now is not a story of survival, but further insight to her clothing. We can see now, clearly that she dresses like us, The West. During rising xenophobia in Europe being prevalent surely a more effective way of realising our compassion is by showing the world we are all the same. Refugees arriving in Europe are escaping the fate of 320,000 Syrians who have been killed back home in Syria since the start of the war in their country four years ago. They have risked it all to ensure their future and that of their children. Should they be judged for aspiring to live?